An Urban Sketcher from Sydney Australia connected me with a Sydney watercolor artist who was coming to visit New York City and we spent two days together this week. I'm constantly amazed at the international world of sketchbook art and the friends I meet through Everyday Matters, Urban Sketchers, and my blog. On Monday Eunice and I met for coffee, and were in the café so long that we ordered and ate lunch! This is a picture of us following lunch and before we went downtown to buy art supplies. 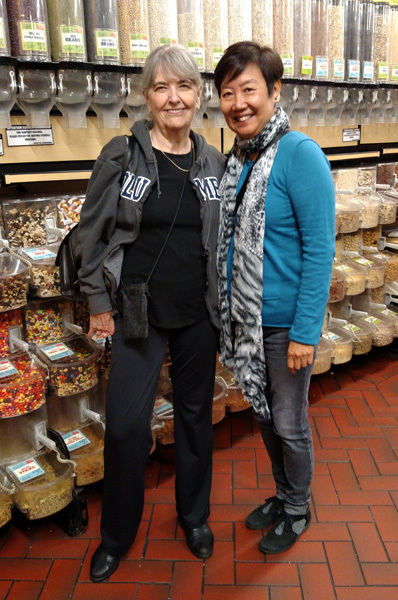 It was wonderful to meet her and I'm delighted that she will be visiting regularly. On Wednesday we met for a combined Weekday Urban Sketchers and Battery Park Conservancy Art Day. 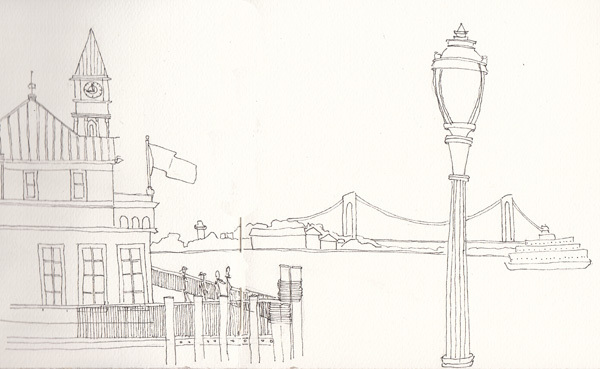 Eunice and I sketched Pier A, at the tip of Manhattan overlooking New York Harbor, and while we sketched we watched Navy and Coast Guard vessels arrive for the annual Navy Fleet Week. Notice the Statue of Liberty, which is on the other side of the harbor, right above the back of this destroyer. 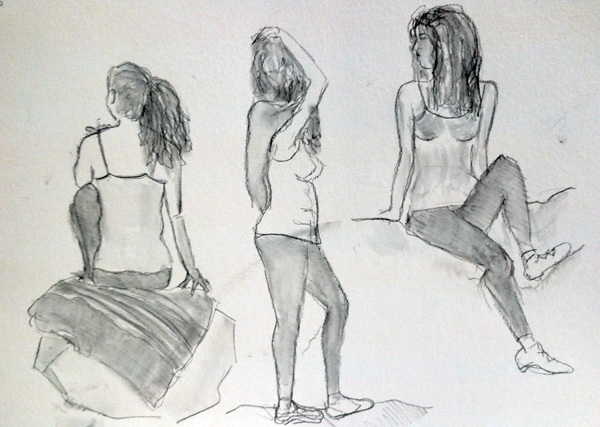 In the afternoon we moved to the Battery Park South Cove for Figure Al Fresco, the weekly figure drawing session sponsored by the Battery Park Conservancy. The wind and cold made it unpleasant, so I did only the 1, 5, and 10 minutes sketches. From left to right - 10 minute, and two five minute sketches done of our model who was sitting or standing on rocks in the South Cove. Next Wednesday it is supposed to be in the 80s, so we will meet again under better weather conditions for outdoor sketching. So glad to see that my "introduction" went so well! Amazing that you connected! I seldom see anything but figures you've sketched. This landscape is fabulous! What a way to spend time! Makes me feel good that our sketchbook community can facilitate your type of meeting.